It's all Walt Disney's fault. A natural born square-- the first and only time I ever got into trouble in school was when I was in the second grade. The fact that I was caught talking about movies during quiet time didn't quite register with what I later perceived would become my calling yet the incident itself registered nonetheless because I had to suffer the humiliation and added shame of scribbling "Jenny" on the blackboard in front of everyone... simply for sharing my opinion about movies or a work from Walt Disney Studios in particular. 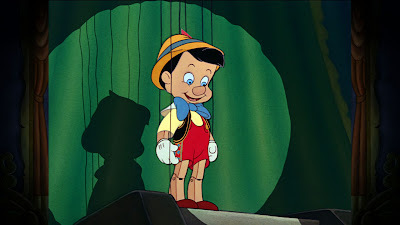 The humiliation stayed with me and I fervently avoided all acts of rebellion from there on out but with that, so did the source of the conflict -- namely by expressing my dislike and fear of Pinocchio which I had just seen in a theatrical re-release. Whether or not my teacher's anger was more directed at the noise I produced during quiet time or rather her staunch admiration for one of Walt Disney’s best loved classics I’ll never know but it was with a mixture of curious fascination and apprehension that I sat down to once again two decades later to investigate Walt Disney’s gorgeous three disc Blu-ray release of Pinocchio for the first time ever presented in high definition. It's always interesting to explore the ways film changes in our views over the years-- whether for the better in Mary Poppins which has become a new favorite or for the worse in the beautiful but blah Sleeping Beauty. In the case of Pinocchio-- oddly my reaction is fairly similar twenty years later. More specifically, it's still scares me to death and it’s still one of my least favorite classics from one of my favorite studios-- however and much more importantly-- despite this, my appreciation and understanding of the story the screenwriters meant to tell has grown enormously with time. 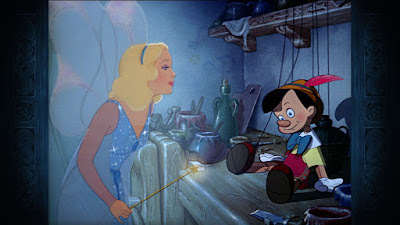 Pinocchio is consistently credited as “the film that taught the world to ‘Wish Upon a Star,’” although and far less cited but in my opinion of equal importance, more admirably it did so with the understanding that “it makes no difference who you are,” in the tag-line and deceptively simplistic lullaby style melody that since has become representative of the Walt Disney Studios itself. While as a child, I was solely focused on the plight of Pinocchio who undergoes a journey that to call disturbing would be a gross understatement, this time around-- as an adult and aunt-- I mostly identified with and was drawn in by the film’s resident mentor and parental figures in the form of Jiminy Cricket and Gepetto respectively. One of the best Disney sidekicks ever created, Jiminy Cricket -- who serves as Pinocchio’s conscience in a way that makes you question his very existence and whether it’s imaginary or not-- has a refreshingly no-nonsense, take no prisoners cynical sense of humor to mask the warmth underneath. Cricket does double duty in the film as its narrator in Disney's frequently employed storybook approach. The movie was based on the children’s magazine fifteen-installment serialized story by an Italian journalist turned unlikely children's author Carlo Collodi whose morally driven but far darker take on Pinocchio in the book seems as though it’s a cross between David Lynch and Edgar Allen Poe. However and much to the relief of viewers everywhere, Pinnochio was softened up considerably from the book’s brat who had actually killed Jiminy Cricket in the text and was initially plotted to hang himself in the finale until Collodi’s editor thankfully talked him out of it. 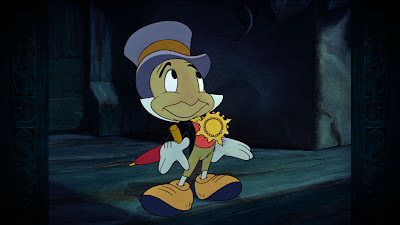 Furthermore, in his transition to the screen, Pinocchio’s unsympathetic and decidedly un-Disney like characterization was altered along with turning the brief “cricket” character into the film’s beloved Jiminy Cricket, as noted in one of the Blu-ray’s extensive extras—this one in the “making-of” roughly hour long featurette included on the second disc. In telling the tale of a lonely Italian woodcarver, toy and clockmaker named Gepetto whose only friends in the world are his cat and fish, we find ourselves touched in what today could be seen as a metaphor for adoption. Moreover and far ahead of its time, when viewed in today's society, it's a work that shows accurately that biological clocks can be found in men as well as women as it is actually Gepetto who is the first one to wish upon a star that his adorably attired little wooden puppet Pinocchio would come to life and become a real boy. When Gepetto gets his wish and Pinocchio springs to life—the film which is set over the course of a fateful action packed day-- takes a multitude of emotional turns as Pinocchio gets a crash course in the basic lessons of childhood involving not going with strangers and never lying precisely because he’s led astray and conned into doing the opposite throughout a majority of its running time. The film moves into menacing territory fairly quickly as Pinocchio is abducted by dangerous amoral schemers on the way to school, later thrown into a cage until he’s lured to the incredibly creepy "Pleasure Island" where boys are urged to smoke, drink, shoot pool, until they’re turned literally into the donkeys or rather “jackasses” that Jiminy Cricket astutely calls them earlier. And while Pinocchio’s veritable fairy godmother-- the blonde and angelic Blue Fairy helps him out of a few brief jams and Jiminy tries to lead him on the path of the straight and narrow-- even more horrifyingly the characters later find themselves in the belly of a whale fighting for the life of their new family. Overwhelmingly the entire film works as a great morality play since it “scares you straight” for a reason and I must admit that although my mother recalls being quite frightened of it when she first saw it as well as when I initially caught it, and I understand what they're getting at-- Pinocchio is still extremely intense even by today's standards. Granted, I'm part of the John Hughes, Steven Spielberg, and George Lucas era whereas today children reared on Lemony Snicket, Harry Potter, and Twilight most likely wouldn’t be as nightmare prone as previous generations were so therefore, I'd lower my initial age recommendation of ten and up (despite its “G” rating) to eight and up. Despite this, I’d still want to recommend to parents that-- unlike some of the other Disney classics that you can basically turn on and walk out of the room-- when it comes to Pinocchio, I’d urge parents (who especially would be the best judge of their children's taste) to gauge what’s appropriate and much more importantly, to watch the film with their children at least for the first viewing. In the superlative Blu-ray release that also boasts a DVD of the remastered film for families who haven’t made the switch to high-definition ensuring that they won't have to buy the film twice, Walt Disney Studios truly outdid themselves. 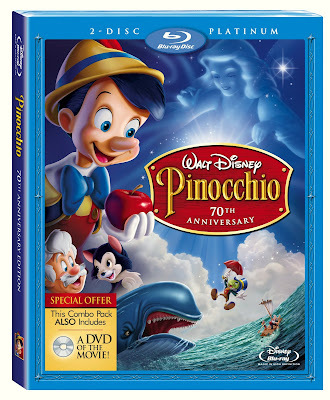 The film boasts a painstaking restoration and in anticipation for Pinocchio’s debut on the Blu-ray format-- preparation began a whole year earlier and involved the expert artistry of employees who “digitally scanned 380,334 frames of four and a half miles of 71-year-old film negative, cleaning 126,778 frames,” thereby adding their contribution to the original work that “took more than 750 artists, 80 musicians, 1500 shades of color and 1 million drawings to bring this ambitious film to the screen” back in its 1940 debut. 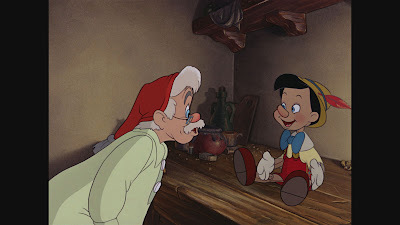 Following 1937's groundbreaking smash Snow White and the Seven Dwarfs (that garnered the studio an honorary Academy Award) and replacing Bambi as the studio’s second feature length animated project-- the start of Pinocchio actually kicked off while Dwarfs was still in production without any idea whether or not their medium and gamble for a dream of animated works would pay off. Despite these changes, it's still one of the darkest and most twisted works in the Disney oeuvre, following the hunter who was supposed to cut out Snow White's heart and bring it to the wicked Queen in a box and just prior to Bambi’s mother getting shot. And admittedly while despite my admiration for the outstanding animation and innovative techniques employed in this remarkable film that is often listed as a favorite among craftsmen, animators, and directors-- it’s still an animated classic that I feel I wouldn’t watch as often as some of the others. However, the restoration and presentation over the course of three discs is awe-inspiring to say the least. Giving viewers several different ways to watch the film on the first disc alone including in its original aspects ratio and with pop-up facts that fill the screen as you watch, it also contains expert commentary from Leonard Maltin, Eric Goldberg, and J.B. Kaufman. Perhaps one of the most creative changes was the Blu-ray’s inclusion of a “Disney-View” option which takes the original “full screen” or square shaped film and gives you the opportunity to “expand” your viewing experience with new enhanced, hand drawn elements. While the purist in me found it a bit distracting and I preferred to just watch the incredibly restored and now nearly 3-D super sharp work in high definition as the under-the-ocean sequence was so beautiful it made my breath catch—it’s a great feature for those wanting to take in more animation as they watch. However, much like all of the recent marquee titles released by Disney that the studio has been kind enough to let me screen, once again I’m utterly blown away with not just the Blu-ray’s clarity and sound in an extraordinary transfer (where you can instantly catch the difference pre- and post-restoration) but rather in their plethora of bonus features on the second disc. Again filling the set with behind-the-scenes, highly informative featurettes, making-of-documentaries, demonstrations of the technology and science employed—it’s an extraordinarily valuable set for anyone interested in not only filmmaking and the Walt Disney Studio but American history as well. Previously, the multiple-disc set produced for the Oscar winning WALL-E was hands-down the best achievement by the studio outside of their Treasures Collection in offering an insider’s view of the goings-on involving sound, animation and design (as well as including the tremendous feature length documentary The Pixar Story) but Pinocchio is now the fairest one of all. It opens up the legendary Disney vaults for everything including Live Action Reference Footage extra that assisted new artists on how to draw set pieces and Disney’s own brand of pre-visualization involving staff members acting things out in fully blocked sound stages that were expertly directed and photographed for the animator’s reference long before the use of computer. Also featuring amazing art galleries, an alternate ending and abandoned scenes including one song shared with us along with (if available) original sketches, diaries, and animations, and a remarkably in-depth documentary— it also boasts another mini gem in its Sweat Box featurette. The tiny theatre that wasn’t equipped with air conditioning where Walt Disney and the artists would screen every single piece of new material from the most basic of sketches put together sometimes from still photography then transferred to film to get a sense of pacing and sometimes with a rough soundtrack of voices (if only via the animators or whoever was around)—it was in the Sweat Box where Walt and the others were able to figure out what worked and what didn’t. Having to analyze every single detail from the pencil tests in some brutally honest exchanges that have all been saved by a hired transcription taker—it’s a delightful and eye-opening view of the way the studio was constantly redefining, re-animating, and correcting the film to a degree that it is no longer done today. While Disney products took years and employed the population of a tiny city to complete and it isn’t economically feasible to make all films in this way anymore-- there’s something wonderfully inspiring and moving when you learn just how much thought went into each and every second of Pinocchio. With filmmakers constantly fighting deadlines and budget constraints, rushing movies into theatres to meet box office weekend crunches and sometimes unable to cut them in the way they’d like or reshoot scenes that don’t quite work in contemporary filmmaking—Disney’s Sweat Box sessions-- just like most of the extras included in this set and numerous others from the studio should be shown to everyone in the business with the hope of reinvigorating all to put out the best product possible. Additionally, as a film lover who—from that young age of getting in trouble for talking about something Disney-related that scared me until now when I can write about it professionally—I think that one of the greatest releases and gifts the studio could give to the world is an in-depth series of DVDs and/or Blu-rays about the history of the studio, techniques employed, and their evolution in the world of filmmaking. Learning much more than you can by simply visiting the theme park and now with the ambition to learn more about the studio’s history—even if, much like this reviewer, Pinocchio itself still freaks you out—the Disney behind-the-scenes or from-the-vault excerpts cannot be missed and Disney should think about offering these separately to both universities and the public whose lives were all touched by their films. Or in the case of Pinocchio-- lives changed for the better simply by their optimistic reminder to wish upon stars in that Academy Award winning song that also seemed to be the motto of the studio where "can't" was never in their vocabulary, which is precisely what we need right now when times and films are so grim.